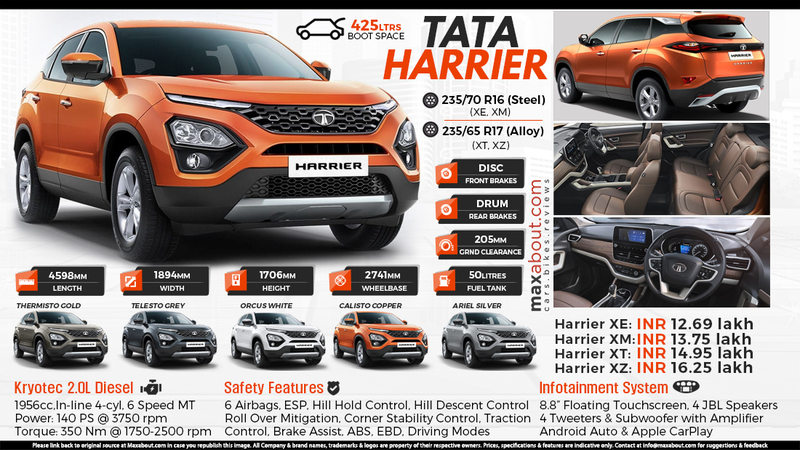 Complete details for the upcoming Tata Harrier are now official, leaving buyers with an exact idea of what they will get after getting their hands on any decided variant. The car is available in 4 variants: XE, XM, XT and XZ, leaving certain top-spec features due to production and sourcing problems. The car measures 4598mm in length and still, brings five seats with loads of space for both passengers and the luggage. The wheelbase measures 2741mm for the new Harrier. The SUV was recently launched with a starting ex-showroom price tag of INR 12.69 lakh. The car is powered by a 1956cc 4-cylinder BSIV diesel engine, which generates maximum power of 140 PS at 3750 rpm with maximum torque of 350 NM at 1750-2500 rpm. The engine is mated to a 6-speed manual gearbox, and as of now, Tata has no plans to launch Harrier with an automatic gearbox. The SUV will initially be available with only manual transmission.